I came for George C. Scott, but I stayed for Faye Dunaway. After Patton (1970), his Academy Award-worthy leading performance, Scott starred in a fascinating mix of films: Anthony Harvey's mystery comedy They Might Be Giants (1971), which I still haven't seen; taut action picture The Last Run (1971); Arthur Hiller's angry and dramatic black comedy The Hospital (1971), written by Paddy Chayefsky and covered in this column last year; Richard Fleischer's boisterous L.A. cop drama The New Centurions (1972); and his own furious social drama Rage (1972). 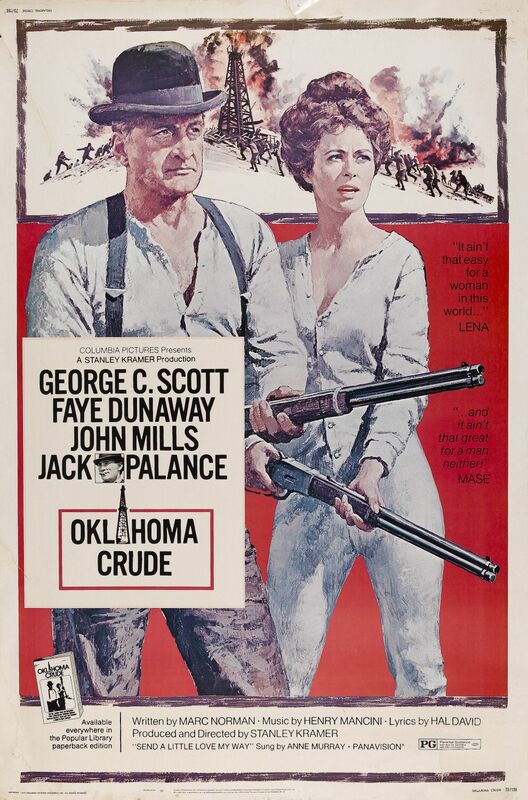 As a young teen, I confess that the sight of Faye Dunaway in long underwear on the Oklahoma Crude (1973) poster is what caught my eye, but I never did manage to see it in a theater at the time. Later, the realization that Stanley Kramer had directed it did not make me eager to seek it out. Kramer was well-known for his so-called 'message movies,' such as The Defiant Ones, Inherit the Wind and Judgment at Nuremberg, and though I respected his intent and saw those and other of his films, I was never drawn into what he was doing. So my renewed interest in George C. Scott is what prompted me to buy Twilight Time's new Blu-ray, and now I'm glad I did, because after two viewings, I'm still not entirely positive what I watched, or what Kramer intended. That's noted in the Blu-ray's audio commentary by film historians Lee Pfeiffer and Paul Scrabo, who both are bigger fans of Kramer's work than I am. Kramer made The Secret of Santa Vittoria (1969), R.P.M. (1970) -- even further out of touch with the current culture at the time -- and Bless the Beasts and Children (1971). Then, perhaps deciding on a change of pace, perhaps realizing that it would be good to make a movie that wasn't dependent on social commentary, he directed Oklahoma Crude. The first-billed Scott plays a down and out drifter known as Mase, but the opening stretches of the film firmly belong to Dunaway as Lena, an unlikely protagonist. In 1913, she has acquired property in Oklahoma and is drilling for oil, amidst the overwhelming and intimidating presence of a big oil company and, of course, an overwhelming number of men. Lena is on the outs with her father Cleon (John Mills), who goes behind her back to hire Mase to help protect her from the competing men, led by the soft-spoken and uber evil Hellman (Jack Palance). Is Oklahoma Crude a drama with a few light touches, as I read it upon first viewing? Or is more a comedy with dramatic touches, as Pfeiffer and Scrabo discuss on the audio commentary? Frankly, I don't even know my own personal conclusion yet. As a drama, it's fine; as a comedy, it's not really my taste; as social commentary (in 1973), it's fascinating for its depiction of a strong woman during a time (1913) when women were expected to shut up and stay at home, as I understand it. The audio commentary is excellent for raising these questions. Pfeiffer and Scrabo speak amiably, bolstered by extensive research and knowledge about Kramer, Scott, Dunaway, Mills, and writer Marc Norman, supplying considerable information and insight. It's an easy listen and a terrific feature; I'm glad to have it. The Blu-ray also includes an isolated music track, featuring original compositions by Henry Mancini, that is great as accompaniment for writing (and also watching the movie again). The transfer looks very, very good, and the colors appear to be accurately reproduced. All in all, Oklahoma Crude is an entertaining picture and this Blu-ray makes it look all the more essential. It may not be among the top ranks for Scott or Kramer, but the Faye Dunaway performance, coming just before The Three Musketeers (1973) and her outstanding work in Chinatown (1974), is definitely praiseworthy. Dunaway's Lena is bawdy, strong and independent for much of the running time. The conclusion of the film is a letdown, more for her character than anyone else, but feels fitting for the 70s. More than anything else, she pushes Oklahoma Crude to what it is today, a fascinating curio of its era that remains surprisingly relevant. 70s Rewind is a column in which the writer ruminates on his favorite film decade.